Camp schedules vary yearly. Here are some of the popular activities that campers may experience. Experienced guides from the Texas State University Outdoor Center will lead campers on a thrilling one- to five-mile white water rafting trip down the San Marcos River. Between rapids, like those at Rio Vista (pictured) or Cottonseed Run, campers will be exposed to diverse riparian and aquatic ecosystems and learn how millennia of human use have shaped how the San Marcos River looks today. NEW THIS YEAR: We will be visiting the lower San Marcos River for the first time in several years. This stretch of river is longer and wilder than the upper San Marcos River where we have paddled for the last 2 years. Not your average cave tour! Camp Director, Ben Hutchins will lead campers through a wild and undeveloped cave called “Snookie’s Cavern”. Campers will be able to see some of Texas’ subterranean wonders, like cave-dwelling animals, Cretaceous-period marine fossils, and natural cave formations. During the ‘challenge by choice’ portion of the tour, campers are invited to get their hands and knees dirty as they traverse a fun route deep into the cave. Campers will learn about cave and aquifer formation and how animals are adapted to subterranean habitats. Afterwards, we head to a spectacular, private swimming hole on the Guadalupe River to have lunch and wash off. During an introductory SCUBA diving course led by certified instructors, campers will spend time diving and swimming in a training facility pool. The experience of weightlessness and breathing underwater, aided by compressed air and a buoyancy control device is like no other. Campers are NOT required to have previous SCUBA experience to participate in this activity. 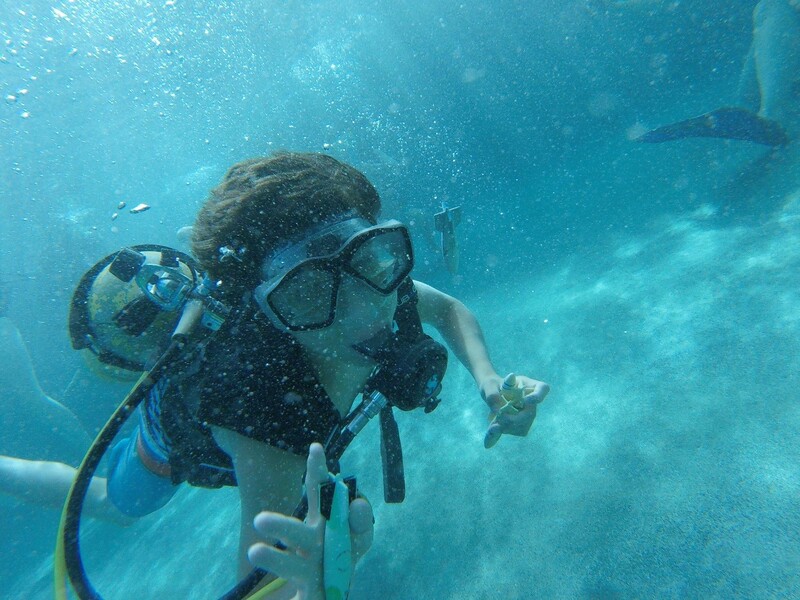 Campers will learn how scientists use SCUBA to study inaccessible, underwater research sites. Students will get to explore the natural beauty of the San Marcos River while snorkeling in the river’s crystal clear headwaters. While snorkeling, students may choose to participate in a nature-based scavenger hunt or to simply enjoy the sights of schools of fish, endangered species such as the Texas Wild Rice, and many other forms of wildlife. Campers will learn about the history, geology, and ecology of the Edwards Aquifer and see the rare and unique animals that call it home by sampling one of the most biodiverse groundwater sites on the planet. We never know what campers may find: cave shrimp, blind leches, and even blind salamanders have been collected. Few people have ever seen these mysterious creatures: it’s an opportunity that can’t be found anywhere else! Campers work together in a hands-on, outdoor challenge to simulate a water supply company. The teams will use their knowledge of physics and hydrology to create a water supply system and race to get water from their well to their “customers”. Aspiring chemists will love our hands-on water chemistry lab! Campers collect water samples from around our campus and then use research-grade equipment to conduct a chemical analysis. Campers use the results from their tests to learn about the interactions between living organisms, pollution, and the physical environment. The Aquatic Science Adventure Camp partners with the Meadows Center for Water and the Environment to provide campers with an interactive educational opportunity. Campers will visit endangered species in the aquarium, watch for birds and amphibians on the wetlands walk, and view San Marcos Springs and abundant wildlife on a glass-bottom boat tour of Spring Lake. NEW THIS YEAR: We’ll have the unique opportunity to snorkel in Spring Lake! This educational program will give campers an immersive environmental education experience in the pristine, crystal-clear waters of Spring Lake. Day campers will get the chance to visit the Texas State Student Recreation Center to enjoy the rock climbing wall, pool, indoor ball courts. Campers will learn how physical skills like rock climbing and single rope techniques allow scientists to access inaccessible research sites. Bouldering or on belay, reaching the top of one of the highest rock walls in the state is a real achievement! University Camp is a Texas State University-owned property on the Blanco River between San Marcos and Wimberley. The 126-acre property features a half-mile of riverfront, hiking trails, an exciting and challenging ropes course, and a natural waterslide! Overnight campers will spend two nights in gender-segregated cabins that serve as a base camp for fun on the ropes course, swimming and fishing in the river, night-hikes, campfires, and more. To see a video tour of U Camp and learn more, visit http://www.campusrecreation.txstate.edu/outdoor/university-camp. NEW THIS YEAR: We will be setting up UV and broad-spectrum lights to attract nocturnal flying insects: students will have the opportunity to see adult versions of many of the juvenile insects they find in the rivers including giant water bugs and Dobson flies! campers are invited to participate in the “challenge by choice” high ropes course on the grounds of the University Camp. Zip-lines, rock walls, and climbing challenges led by trained staff will provide campers with the chance to challenge themselves in an outdoor setting. Campers will learn how physical skills like rock climbing and single rope techniques allow scientists to access inaccessible research sites. At least once a day, campers get a chance to enjoy swimming in one of three local rivers: the San Marcos, Blanco, and Guadalupe. Be it a natural rock water slide, rope swing, or diverse biological community, each river has something unique to offer. Campers will be supervised at all times by counselors and trained lifeguards. Many of our summer staff are college students majoring in Recreation Administration or Therapeutic Recreation. As students of recreation, they always come up with a roster of awesome games, activities, crafts and team-building exercises that are an integral part of giving our campers the best possible experience.